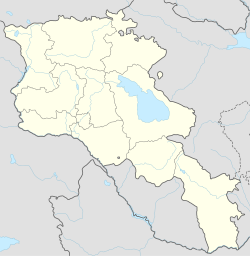 Meghri (Armenie: Մեղրի; Romanizit as Mehri, Mughru, Myghry, Mergi, Megry, Megri, an Mogri) is a ceety in soothren Armenie, locatit in the Syunik Province, near the mairch wi Iran. The ceety's economy is based on the fuid industrie, an contains a breid-bakin factory, canneries an a winery. Meghri haes a significantly milder climate than the rest o the ceeties in Armenie, an produces fruits no foond in ither pairts o the kintra. Meghri forms an urban commonty (municipality). The Naitional Statistical Service o the Republic o Armenie (ARMSTAT) reportit its population wis 4,775 in 2010, doun frae 4,805 at the 2001 census. A nearbi Roushie militar base hooses aboot 2,000 sodgers, who alang wi Armenie sodgers guard the mairch wi Iran. The Iran-Armenie Natural gas pipeline passes throu the ceety. In early 2007, it wis reportit that the govrenments o Armenie, Roushie, an Iran are plannin tae big an ile refinery for petrol export tae Iran. This project wad be led bi Gazprom. Meghri is the anerlie place in Armenie that produces pomegranate. A poleetical firestorm ignitit efter the Key Wast Peace Talks atween Armenie an Azerbaijan ower Nagorno-Karabakh. Azerbaijan annooncit that Armenie affered tae swap the stretch o Armenie territory that separates Nakhchivan frae the rest o Azerbaijan, cried the Meghri strip, in exchynge for offeecial Armenie sovereignty ower the Lachin corridor. Opposition tae this plan eruptit in baith kintras, an Robert Kocharyan an Heydar Aliyev haed tae quickly disavou the proposal. ↑ Land Swap in Nagorno-Karabakh: Much Noise Over An Unrealistic Option.Tigran Martirosyan. 14 August 2002. Central Asia-Caucasus Institute. This page wis last eeditit on 10 Mairch 2018, at 23:49.